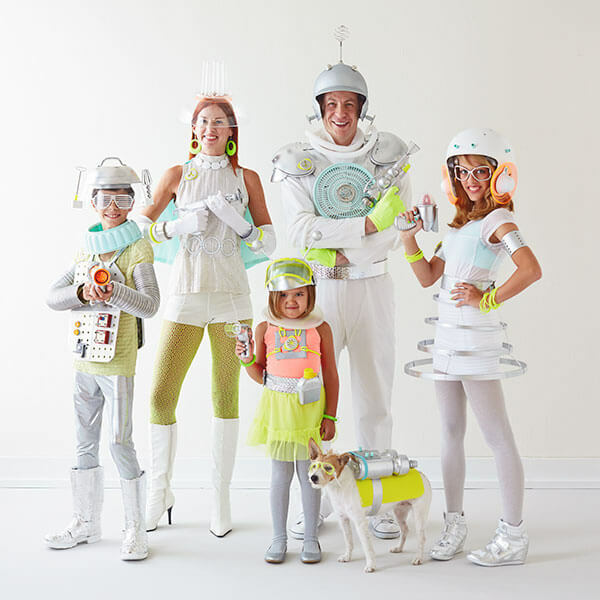 Morph Mom and Dad into super-techno-parental units with vintage white clothes, silver and neon accessories, toy guns and kitchen gadgets. Download the instructions for the full list of items and additional details. Tip: Be resourceful: shop at thrift stores and dollar stores first to save money, then try vintage shops and hardware, costume and toy stores for more odds and ends. Get your girls all set for a galaxy of adventure with miniskirts, tights, neon accessories, embroidery hoops and giant hair curlers. Download the instructions for more ideas and item details. Tip: Think about anything and everything: duct tape, knobs, nuts and bolts, bits of plastic, wire, cord, wood pieces, light bulbs, aluminum pans, plastic dishes, strainers, cooking gadgets, old sporting equipment, paint and craft supplies. But think lightweight—you don’t want to make the costumes too heavy to wear. 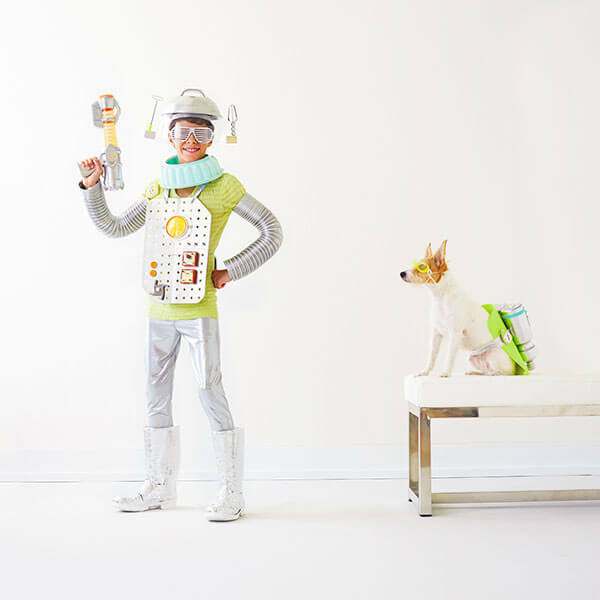 Build a better robot with odds and ends from your kitchen and garage like dryer vents, pot lids, water bottles and silver duct tape. Download the instructions for more details and a full list of items. Tip: Silver spray paint is a great “space-maker.” Objects take on a completely futuristic look with a coat of silver spray paint. Also helpful to have on hand: a drill, nuts and bolts, 5-minute epoxy, adhesive removers, sand paper (to scuff plastics and metals before painting) and Velcro.